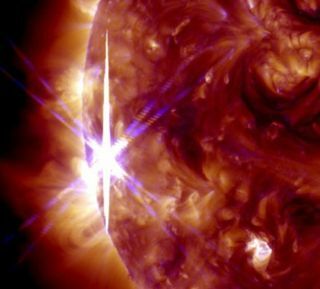 This image of a solar flare on Oct. 25, 2013, was captured by NASA's Solar Dynamics Observatory, or SDO. The flare, an X2.1, appears as the bright flash on the left. Things are really starting to heat up on the sun. Our star blasted out yet another strong flare late Friday morning (Oct. 25), continuing a pattern of high and intensifying solar activity over the past few days. Friday's two monster flares came closely on the heels of a moderate M-class eruption and another one that nearly reached X-class status, peaking at M9.4. The Wednesday night (Oct. 23) eruption that produced the M9.4 flare also generated a huge cloud of super-hot plasma known as a coronal mass ejection (CME), which can streak through space at millions of miles per hour. Three other CMEs erupted between Sunday and Tuesday (Oct. 20 to Oct. 22), and they merged into a single cloud of material as they headed toward Earth. None of this activity is expected to cause major problems here on Earth, experts say, though both of Friday's flares caused temporary radio blackouts in some regions. It's not surprising to see so much action on the sun, scientists say. Our star is in the peak year of its current 11-year activity cycle, which is known as Solar Cycle 24. Increased numbers of flares and CMEs are common during solar maximum.